The long term survival of polar bears is being threatened by man-made pollution that is reaching the Arctic. This conclusion comes from a major review of research into how industrial chemicals such as mercury and organochlorines affect the bears. The review suggests that such chemicals have a range of subclinical effects. When added together, these can have a dramatic and potentially fatal impact on the bears' bones, organs and reproductive and immune systems. The review, an analysis of more than a decade's research into the effect of pollution on bears, is published in the journal Environment International. A range of man-made pollutants reach the polar Arctic region, carried there in the air and water. These include toxic metals such as mercury, organohalogen contaminants (OHCs) including organochlorines, and polybrominated diphenyl ethers (PBDEs) and perflourinated compounds (PFCs), which are used industrially in insulating fluids, as coolants, in foams and electronics and as pest control agents. Such chemicals are often fat-soluble and accumulate in the fat of many animals, which are then eaten by top predators such as polar bears. These top predators are then exposed to increasingly concentrated levels of toxins. 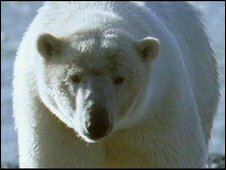 But the impact of these toxins on polar bears has been difficult to measure, with the only previous studies done by the Arctic Monitoring and Assessment Programme in 1998 and 2004. That is party because it is logistically difficult to take many and repeated samples of blood or tissue from live polar bears. Also, only free-ranging healthy animals that are not clinically sick tend to be sampled, making the overall population appear to be healthier than it already is. 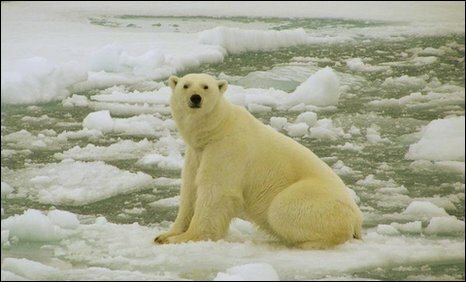 So veterinary scientist and polar bear expert Dr Christian Sonne, of the Department of Arctic Environment at Aarhus University in Denmark, conducted the first review of all pertinent research on the health effects of such contaminants on polar bears. Previously, Dr Sonne was part of a team of researchers which found that "stress" linked to pollutants and shrinking sea ice appeared to be shrinking polar bears. His new analysis includes the results of more than 200 organ and skull tissue samples taken from 80 bears in East Greenland between 1999 and 2009, as well as repeated measurements and observations of bears living in the Svalbard archipelago, Norway. These studies reveal a number of ill-effects associated with industrial pollutants. However, such studies can only show that contaminant levels are correlated with ill-effects, not that they cause them. So Dr Sonne investigated the direct impacts of Arctic pollutants on two other top predators living in the region, Norwegian Arctic foxes and Greenland sledge dogs. In 2003, researchers started a two-year study in which they fed Arctic foxes clean or contaminated whale blubber. One fox of a pair of brothers was fed clean food as a control, while the other brother ate contaminated food. Having eliminated all other influences, such as gender and age, the researchers showed that foxes exposed to environmental levels of pollutants do suffer harmful effects. For example, PCBs trigger decreases in bone density and damage the liver, mercury and organochlorines cause renal lesions, while OHCs alter the amount of vitamins circulating in the blood. Similar effects were found in comparable studies on Greenland sledgedogs. "Polar bear studies are correlative, but that is not conclusive as being 'cause and effect'," explains Dr Sonne. "So including dogs and foxes as model species is important [because] you use species that are much like polar bears, and the species were exposed to similar food items as polar bears." The impact on the bears is likely to be greater even than those effects which show up in studies. "It is really important to understand that all organ systems are tied together," says Dr Sonne. So individual pollutants may only have subtle, non-clinical effects on particular parts of a bear's body. But in concert, the overall impact can be devastating, reducing an individual bear's ability to hunt, reproduce and resist disease. "After being very sceptical, I now feel that the impact on bears may be true," says Dr Sonne. He also concludes that climate change will exacerbate the impact of pollutants on the bears. As the level of sea ice declines with warming temperatures, polar bears are fasting for longer. That may mean they eat fewer seals and therefore less pollutants overall. But they will have to burn fat to compensate. That will release greater concentrations of toxins from their fat stores into their blood, says Dr Sonne. This will cause further illness, weakening bears that will already be in poorer condition and may be exposed to new and more virulent pathogens capable of surviving in a warmer Arctic. Dr Sonne's research is published a week after another separate study published in the journal Arctic showed that polar bears in the southern Beaufort Sea in the Arctic Ocean are occurring more frequently on land and open water, and less on the ice.